As the Holiday Season gets into full gear office managers and CEO’s alike are beginning to consider the steps necessary to hosting a holiday office party. Whether for employees or a client appreciation party there are many logistical factors that go into planning a catered holiday party in Peoria, AZ – regardless of the size. Over our years of experience providing corporate catering throughout Phoenix we have learned a number of tricks that will help keep you on budget, and avoid any unnecessary stress in this already stressful time of year. While the words ‘Holiday Office Party’ typically invoke resigned sighs and disappointed glances, here are 10 tips by our corporate catering experts to ensure that your guests actually have a great time this year! 1. Determine a budget first. Identify what aspects of the party are most important, allocate the budget accordingly – and then stick to it. Nothing puts the damper on a holiday spirit like overspending. 2. Order food everyone enjoys. Everyone has their favorite holiday dishes, but they may not all be the same. Ordering off of the Sardella’s Catering Menu ensures everyone will be able to eat something they enjoy. Whatever you do, DO NOT try to turn the party into a pot-luck. 3. Opt for a theme. Rather than simply relying on ‘holiday’ as the theme of the event, select something more specific to encourage attendees to get in the spirit of the party. 4. Send invitations and request RSVP’s. A simple email or evite will suffice if you don’t have the time or the budget to send paper invites to get the word out with all the party details. Include an RSVP to help you accurately plan the quantities of food, drinks and favors that need to be ordered. 5. Don’t try to manage everything yourself. Coordinating decorations, guests, gifts, and all the other details that come up can be an overwhelming task. Outsource one of the most time consuming and stressful details – the food. Corporate catering provided by Sardella’s Pizza and Wings offers diverse menu options, on-site delivery and setup, and easy cleanup. 6. Invite families. This simple gesture is a nice way of acknowledging that your employees have a life outside the office. Most Americans spend more time at work than they do at home, use your holiday party as a unique opportunity to join the two worlds together. 7. Plan activities. Nothing is worse than walking into a room full of food and decorations and seeing employees silently standing around the edges. Planning activities and games can help break the ice and get everyone engaged. 8. Consider lunch instead of dinner. Employees’ time is valuable especially during the holidays. Be respectful of their time by scheduling your holiday party during work hours rather than expecting additional time after a full workday. 9. Don’t forget music! A simple top 40 radio station or some holiday favorites on an iPod will help set the festive mood and prevent awkward silences just in case conversation hits a lull. 10. If you are serving alcohol, don’t make it endless. The holiday party may encourage employees to cut loose and have a great time free of inhibitions, but keep in mind these people still have to work together the rest of the year. Help avoid embarrassing situations by limiting party attendees to a max of 2 drinks. Holiday parties can be disastrous if they are not well planned, but they don’t have to be the nightmare that employees have come to expect. By thoughtfully considering the needs of the attendees, sticking to the overall corporate culture to help guide formality and behavior, and getting help when and where you need it you can plan a party that is a huge hit. 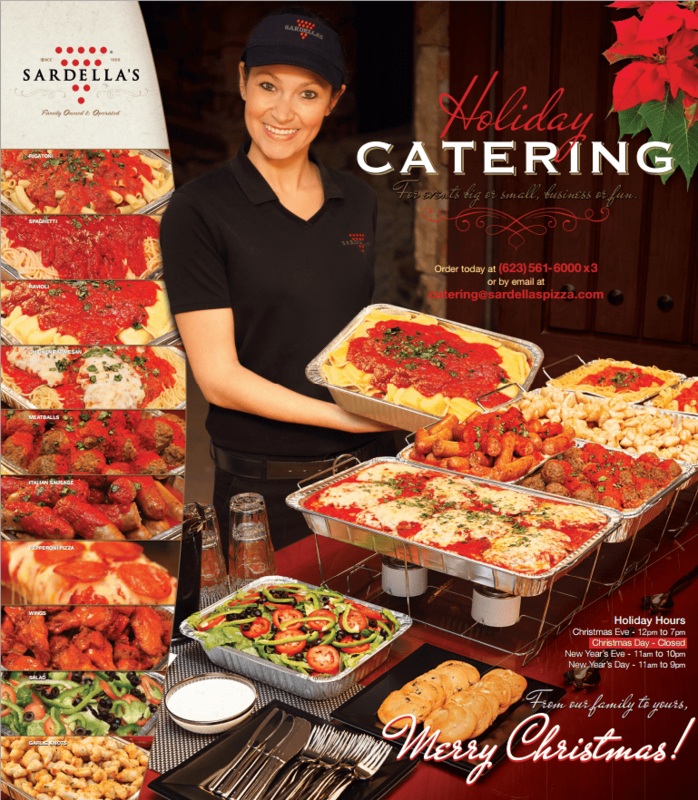 This year as you are planning your corporate holiday party in Phoenix consider the catering services of Sardella’s Pizza and Wings. View our catering menu online, and call 623-561-6000 x 3 to speak with the Catering Manager.